There is a tradition or two when it comes to naming directions or positions of things in a church. Most of the time, front, back, left and right make sense if we keep the point of view of standing in the nave facing the main altar, but the church has developed its own directional glossary. Traditionally, churches have been oriented with the altar at the east. There are some major churches of which this is not true (the high altar of the Vatican Basilica is at the west end), and some modern ones which have abandoned this convention. There are also a fair few that are not quite on an east-west axis. Whatever the actual compass reading, we can call the altar end of the church ‘liturgical east’ and name the other cardinal directions from it. This is particularly helpful if a church has one or more secondary altars that are not oriented parallel with the main altar. Most of the ceremonial is carried out as if the altar were to the east. Sometimes it is important to know where actual east is. At a time when most Catholic masses were said with the priest’s back to the congregation (ad orientem, ‘to the east’), the Vatican and other Roman churches with high altars at the actual west celebrated mass with the priest facing the congregation across the altar (versus populum, ‘opposite the people’) so that the priest could celebrate facing actual east. Now that most masses are celebrated versus populum, the Vatican arrangement appears less unusual. Major architectural features are often known by their compass position: west window, south door, north transept. These tend to be used when the actual compass directions and the liturgical ones more or less align. If one knows the high altar is to the east, everything else is easy to locate. In terms of choir singing and placement, the Latin terms decani and cantoris are used, often abbreviated to dec. and can. Decani means ‘of the dean’ (decānī is the genitive singular of decānus) and refers to the liturgical south (congregational right) side of the choir, where a cathedral’s dean would normally be seated. Cantoris means ‘of the cantor’ (cantōris is the genitive singular of cantor) and refers to the liturgical north (congregational left) side of the choir, where a cathedral’s precentor (‘foremost cantor’) would normally be seated. Decani and cantoris are used even in churches that do not have deans or precentors, owing to the importance of cathedrals in sustaining choral music. In Salisbury Cathedral, the dean and precentor are seated in the first return stall on their respective sides. These are the first, east-facing, stalls to each side on entering the quire from the crossing. As Sarum was the liturgical norm of pre-Reformation England and Wales, this arrangement was followed in cathedrals of the Old Foundation, which have deans and precentors as their senior clergy, and has become the standard elsewhere. In the monastic cathedrals, where the senior cleric under the bishop was the prior, he often sat on the liturgical north (congregational left). Thus, some cathedrals of the New Foundation (those that were monasteries) seat the dean in the former prior’s stall, opposite to where the Sarum dean is placed, and decani and cantoris are reversed (this is true of Benedictine Durham and Augustinian Carlisle, and a couple of other places). These terms are especially used in Anglican chant where the music is sung antiphonally, passed back and forth between the two sides of a choir. In antiphonal singing, decani generally sings first, answered by cantoris. In typical singing of the psalm at choral evensong to Anglican chant, the entire chant is sung in full (both decani and cantoris together in harmony) over what is usually the first two verse (in double chant). Then decani sings alone in harmony, and then cantoris sings alone in harmony, and so on, with Gloria Patri (‘Glory be to the Father …’) sung in full at the end. Some choirs will alternate the starting side, often every week. The other set of directional terms are ‘gospel’ and ‘epistle side’. The simple definition is that the epistle side is the liturgical south (congregational right, decani) and the gospel side is liturgical north (congregational left, cantoris). There are all sorts of explanations for this. The simplest is that Christ is seated at the right hand of the Father, the place of honour, and, if we face God in prayer, that is our left. Thus, Jesus’ Good News, his Gospel, is preached from that side. Mediaeval churches often have the lectern built on the epistle side and the pulpit on the gospel side. This is so that the gospel could be proclaimed from the righthand side of the Father. To reflect this, the priest at low mass would move the missal, from which all lessons are read, from the epistle side of the altar, after reading the epistle, to the gospel side, for reading the gospel. Post-Vatican II liturgical thought has focused on a unified proclamation of the Word at the heart of the mass. Practically, this is often expressed by use of a central ambo (either fixed or movable) from which all lessons (including usually the responsorial psalm) are proclaimed. However, Pope Francis has begun using both an epistle-side and a gospel-side post in his outdoor masses, with the readings made at the epistle-side lectern and the gospel from the gospel side. Terms such as epistle and gospel side are often used to describe positions in the sanctuary. For example, the paschal candle is placed on the gospel side of the sanctuary and the sedilia (or ministerial chairs) are on the epistle side. These terms are also used to refer to the order of lighting and extinguishing altar candles. Candles on the epistle side are first lit, then those on the gospel side. In each case, if there are multiple candles on each side, those closest to the centre, to the cross, are lit first, moving outwards on that side before moving to the other. The extinguishing of candles is done in reverse order: gospel side, out to in, then epistle side, out to in. When the paschal candle stands in the sanctuary, it is at the gospel side and is lit before any altar candles and is the last extinguished. The story is that this is supposed to represent the spread of the light of the gospel moving from the Mediterranean south to the dark, barbaric north, and so southern candles are lit first. The story was probably invented spiritually to explain why a certain practice is followed. It is more likely to have come about because the right is the side of honour. Right as the side of honour, but which right? Traditionally, the right (dexter) is the side of honour, having higher importance than the left (sinister). Sorry, lefthanders. This explains why the congregational right is where the dean is seated and the decani half of the choir sings first. It also explains why the candles are lit first on the congregational right of the altar and why the sedilia is also placed on that side. The other right is the congregational left. It is the righthand side from the point of view of Christ on the altar cross, or of God in Trinity whom we address in prayer and praise. This is why the gospel is proclaimed from this righthand side and the paschal candle put there. Thus, stripping aside all pious explanations, it seems that, throughout liturgical history, important things and people were placed on the right. However, seeing as both sides can be seen as right, some things follow the one convention and some the other. A recorded instance of this flipping of viewpoint can be seen in the 1488 publication of a ceremonial by Augustine Patrizi, bishop of Pienza, near Siena. Whereas formerly the altar’s left and right side had been named from the congregational viewpoint (and that of the priest celebrating ad orientem), this new ceremonial insisted that the left and right hands of the outstretched corpus of the altar cross should determine directions, leading to their complete reversal. This was then accepted by Pope Pius V (excommunicator of Elizabeth I), entering the first standardised set of rubrics of the first ‘Tridentine’ missal of 1570. The bishop’s throne (cathedra) is most traditionally set in the apse behind the high altar of the cathedral, facing west. The inconvenience of the position and the filling of apses with chapels and shrines led to a removal of the cathedra to the quire, where in many cases there was already a secondary throne. There it is usually placed on the south side, decani, as is the choir cathedra of Greek bishops, facing north. An alternative, often followed in more modern cathedrals, is to place the throne on the north side, the gospel side, of the sanctuary, facing south. In Anglican parish churches, a chair is often kept for the bishop when they visit. When in use, it is usually placed on the centre line of the church facing west. When not in use, it is traditionally placed on the gospel-side wall of the sanctuary facing south. In English parish churches, I have seen the incumbent’s stall placed on either of the two rights, decani or the gospel side. In many places there are identical stalls on each side, the other being for the parish clerk, Reader or curate. It may be that the designated sides have swapped over time. Categories: Anglicanism, liturgy | Tags: ad orientem, altar, Anglican chant, antiphonal, apse, back, Bishop, blazon, bride, candle, candles, cantoris, cathedra, cathedral, côté cour, côté jardin, ceremonial, chair, chant, choir, church, congregation, credence, cross, crucifix, deacon, dean, decani, dexter, east, epistle, epistle side, family, front, Gospel, gospel side, groom, house left, house right, left, liturgy, marriage, nave, New Foundation, north, north end, north side, Old Foundation, paschal candle, port, precentor, priest, prior, prompt, quire, right, sanctuary, sedilia, side, singing, sinister, south, stage left, stage right, stall, starboard, table, throne, transept, Tridentine, usher, versus populum, wedding, west | Permalink. Old picture of the author wearing Anglican choir habit. Reformed tradition — this is the form of vesture that was eventually created for the Church of England after the Reformation: cassock (double-breasted of course), surplice, hood and scarf are the main ingredients. This tradition remains strong amongst conservative evangelicals and old low-church traditionalists. Its centuries as the official vesture of clergy make this the top trump of Anglican style: never wrong for any liturgical occasion, in spite of what the invite might say. If you’re really lucky, an adherent to this style might preach in gown and bands. Wigs, unfortunately, are now uncommon. Liberal tradition — this takes its cue from Vatican II and 20th-century moves to liberalise and simplify vesture: cassock-alb and stole are the main ingredients (the bare minimum to satisfy canon law). 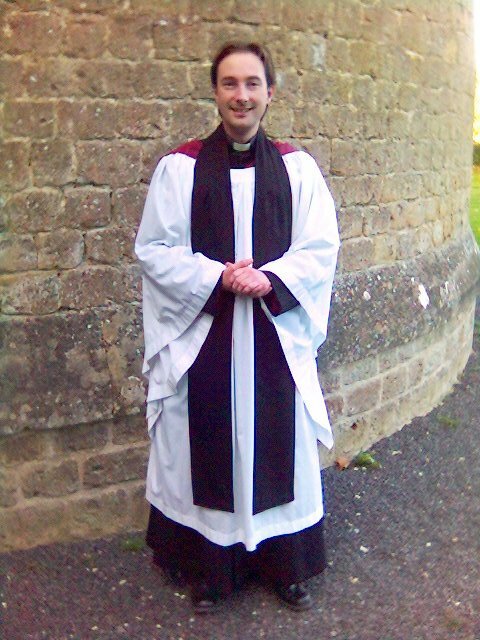 This is the vesture of the lead character in Rev, and is now the norm in middle-of-the-road Anglicanism. The cassock-alb is like the liturgical equivalent of Ugg Boots. While it is possible for the cassock-alb to be simple, unfussy, it is far too easy for things to go pear-shaped — an oatmeal polyester pear. Stoles and scarves (whatever the difference might be!) make use of nice, often personalised, embroidery. Whenever two or more clerics of this persuasion meet there will inevitably be a colour clash, often enough to turn sensitive Anglo-Catholics low church. Abolitionist tradition — the reformed and liberal traditions did not go far enough for some for whom even a clerical collar is dressing up: no vestments is the idea. This tradition is most popular among charismatic evangelicals. Even here there is a spectrum of fashion: those who wear a suit because they mean business, and those who wear jeans because they want to be down with the kids. Of course, not wearing vestments is as much as a statement as wearing them, and draws attention to and even clericalizes what is worn instead (as the blue suit and tie has become in some protestant churches). Celebrating main Sunday services regularly in this manner is a flagrant breach of canon law, but the bishop will try not to notice. Sarum tradition — the liturgical ‘archaeology’ of the late 19th and early 20th centuries, led Percy Dearmer, among others, to seek and revive a distinctively English pre-Reformation vesture, particularly from the Sarum liturgy books. The point was to look Catholic without looking Roman: a way of being high church without the wholesale adoption of Roman fashions. The thoroughgoing version of this tradition is all but extinct: there are very few who use one of the reinvented Sarum liturgical colour schemes (brick red, blue, yellow?) or consider resurrecting the almuce (fur is not an ethical look). Yet its mixture of dignified, simple catholic vestments at mass (mostly now from the Roman tradition than any real attempt to recreate Sarum norms) alongside the seriously Anglican surplice and scarf at offices (the reformed style) meets some refined expectations, and it has become the standard Anglican compromise in many of the big establishment churches, like cathedrals, major churches and Oxbridge chapels. Anything too Roman is rejected: lace, birettas, skullcaps and cottas. Anything too liberal is likewise rejected: cassock-albs, polyester, communion without a chasuble. Roman tradition — perhaps because the Roman Church sets out its rules on vesture with such detail it is attractive to Anglo-Catholics: cassocks, albs, chasubles and cottas are the order here. In many ways, the late 19th and 20th centuries have seen much of this tradition become mainstream in the church: particularly noticeable is the use of Roman liturgical colours. One might say that the liberal and Sarum traditions above are simply Roman style repackaged for Anglican sensibilities. Lace and birettas are the mark of serious adherents to this persuasion, and surplice and scarf are out. There are some of this tradition who are more into the Vatican-II style (liberal style but with separate cassocks and albs, plus chasubles), where others are positively Tridentine (pass the maniple, Father!). Categories: Anglicanism, liturgy | Tags: alb, almuce, Anglican, Anglo-Catholic, Anglo-Catholicism, bands, biretta, cassock, cassock-alb, catholic, charismatic, chasuble, Church of England, clergy, clerical, collar, conservative, cotta, dress, evangelical, fashion, gown, hood, lace, liberal, maniple, Percy Dearmer, reformed, Roman, Sarum, scarf, stole, surplice, tippet, Tridentine, Vatican II, vestments | Permalink. Was Saint Peter a Buddhist monk? Enter your email address to subscribe to this blog and receive notifications of new articles by e-mail. Theoreo means, in New Testament Greek, to wonder, ponder, or 'chew over.' Theore0's are my reflections on current issues, facing the Church and Christians. I frequently consider issues such as the relationship between faith and economic life, Christianity and leadership and, other ethical issues. Many of these issues are covered in a book I co-edited called Theonomics (available either through Amazon or direct from Sacristy Press). All views are my own. I aim to provoke and stimulate wider debate, for the common good and hope not to offend.